Hello, my name is Elaine. I'm a self-taught intuitive artist (painter) from Malaysia. I started my painting journey back in 2009 when I was deeply intrigued by a 30-Day-Artist movement led by a fellow artist, of which I took a month off from work and began creating relentlessly. I produced more than 40 artworks out of that, which later on became part of my debut solo art show called 'In Between Midnights' in Kuala Lumpur. I have since then, participated in a number of shows and exhibitions, both locally and internationally. Predominantly using acrylics and marker pens on stretched canvas as my favourite medium, I create vividly colourful images, sometimes incorporating symbols of black cat in the form of silhouettes in my paintings. Through my paintings, I aim to communicate or evoke a particular purpose and emotion, a reminder of an intention set for life's growth, an introspect look into one's deeper self and psyche, the enchanted world viewed through the eyes of the black cat, a longing for a life filled with colours and delights. Fascinated by the embodiment of the mystical symbolism and the alluring side of femininity the black cat that presents in cultures and beliefs worldwide as well as in dreams, the black cat has over time became a vehicle and nuance in my artistic expression. On the other hand, I also deal with exposing my own vulnerability, as well as personal chronicles through thematic series in my paintings. Together with my technique of outlining with marker pens on acrylics, my artworks are whimsically expressive, intensely colorful (though sometimes I just love the classic black and white colors), doodly and intuitive. The scenes I often include in my paintings can be seen as an intentional set up, and I hope that, upon encountering my work, I can transport the viewer into the magical world I created where manifestations are possible. My work is grounded in self-determinism, the belief that art can deliver healing messages to the beholder and a great desire to make an impact and contribute to the greater consciousness in the world around me. I was born in Kedah, Malaysia and but I spent my life growing up in different cities in Malaysia due to family movement and by choice. From a very early age, I've always been fascinated with painting and drawing. In school time, my artworks were frequently featured in classroom's notice boards. I was once selected to design & paint the school mural. Since art was not encouraged and also not a favorable profession for a typical Asian family in Malaysia, I went on to pursue Computer Science for my college years. I found myself being in the IT industry for almost 15 years before I made that giant leap to quit my high flying career and paint full time. Part of me always knew something wasn't quite enough with life, as I always felt like an impostor when I put on my suit to work every morning. Although making art has always been a childhood pastime, I stopped painting when I entered college. I did not pick up the brush for a long while after that. The high work demands at the corporate world stole away my drive and time to make art for many years, until one fated day when I met a fellow artist in an art supply store, back in 2009. I was shopping for art materials when I heard that a painting workshop was going to be held there. I signed up and it was during the workshop that I met this artist who started a 30-day artist movement. Deeply intrigued and highly steered by it, I took a month off from work and began unstoppably painting again. I produced more than 40 artworks out of that challenge, which later on became part of my debut solo art show called 'In Between Midnights' in Kuala Lumpur. I didn't stop painting ever since that fateful day. My then day job required me to fly all over for projects, and I would always pack a box of colors and small canvases in my suitcase with me so I could spend my evenings drawing and painting in hotel rooms. Probably only the housekeeping staffs would know of my hidden identity, because I was careful not to be seen as an 'artsy' person in the presence of my colleagues or corporate clients! It's just that being a serious Capricorn rising person, I strive hard to keep up with a professional outlook at all times. (My star sign is Cancer, by the way). in 2011, I Moved to Germany alone and started a new life there. I landed myself a nice permanent full time job as a software consultant in Munich for a great German firm in 2011, a move to further my IT career. After 4 years of wonderful life in Germany, I knew I had to make an important decision. A radical step to change my life to be more authentic before it is too late. I needed to do what I always really wanted to do. Even though waving goodbye to a steady salary went against everything I was instilled growing up, I knew I had to follow that calling in my head that has been bugging me for years. So I quit my awesome corporate gig - a career I've built up for over 15 years, confirming to my friends and family that I was crazy and stupid. Me, working hard to complete the 30-Day-Artist challenge. My last bold move was holding a solo art exhibition in Munich to showcase all the paintings I have been working on throughout my 4 years of life in Germany. The Cats Are Out" in May, 2015 was a show chronicling a series of my secret side as a closeted artist. Self-funded the show and organized everything myself with the help of a few dear friends, I invited all my work colleagues including my bosses to come to my 'vernissage' (opening night), and I had a blast finally coming out of my self-imposed cell. Following that, I then traveled to Romania to stay at my best friend's home for 3 months to paint and work on my online store before returning home to Malaysia where I started a creative space in 2016 so I could make art full time and also share the space with like-minded people. Nowadays you can find me at The Hatchery Place where I paint, draw, hold workshops and also mingle with other creatives daily. Me, painting in Cluj, Romania, August 2015. I usually start a drawing by building on a vision in my mind of which I quickly sketch onto my notebook before they disappear or are forgotten. Along with the vision, I "listen" for the message, colors or the story and meaning that revolves around the vision. I then would continue to work on the draft on canvas with pencil. The composition stage is where I select what colors to work with and paint the first layer with brushes and other tools. I tend to always finish a painting with outlines using marker pens. As a self-taught artist, I follow different creative energies throughout the process and I’ve learned to trust what is guided and its flows. It always feels to me that my hand assumes the role of a channel that bring forth images from the magical world of creations onto the canvas that I work on. I have also developed a personal ritual for each time I start to work on my paintings now. I realized that each artwork created carries an energetic expression that will produce an effect on the beholder. Therefore, I usually do a quick meditation or mantra chant to clear my energies and to put myself in a calm state of mind before I take the paint brush. I like to create artworks that presents a subtle priming effect which may stimulate the unconscious mind with its constant presence. They become a space that holds the intentions and wishes when I paint, which then radiates out to the beholder. Well, these works are not for everyone! With my favorite music in the background, I am usually at my most joyous state when I create and I tend to focus intensely during the process of creating. I hope my works can inspire & delight you as much as they inspire & delight myself when making them! WHAT MY ART STANDS FOR? We are all attracted to what we are missing in our life. Maybe at times, you are like a wolf in sheep's clothing, blended in a world full of flocks of sleeping sheep, and you feel like you don't have the power to break away from the system's monotonous, limiting routines. And yet, you secretly harbour an utmost desire to escape from it all, to finally have the courage to walk the other path. My paintings share the same secrets with you. If you feel drawn to them, I believe they are revealing and connecting you to that rare little moments in life where you get to experience glimpses of dreams calling to you, and know that they are real. They are asking you to dare to be you! My artwork carries a message, a lesson, a nudge, or just an invitation for the audience to reflect and ponder upon, in our quest to navigate our chosen lives on earth. Through my paintings, I aim to communicate or evoke a particular purpose and emotion, a reminder of an intention set for life's growth, an introspect look into one's deeper self and psyche, the enchanted world viewed through the eyes of the black cat, a longing for a life filled with colours and delights. The scenes I often include in my paintings can be seen as an intentional set up, and I hope that, upon encountering my work, I can transport the viewer into the magical world I created where manifestations are possible. My work is grounded in self-determinism, the belief that art can deliver healing messages to the beholder and a great desire to make an impact and contribute to the greater consciousness in the world around me. I also believe that eccentricity and unconventional thinking should be encouraged, rewarded and cultivated. Being a curious alchemist, I never stop experimenting using other mediums and mixes like stones, woods, scents, herbs and spices, etc. in my art creations, as I am also profoundly drawn to the energy and healing power of earth medicine. I currently live and work in Subang Jaya where my partner and I run a conscious creative coworking+coliving space called The Hatchery Place. I have my artist studio set up upstairs where I show up everyday to work on my art and business. We also welcome and accommodate conscious creative travelers, as well as locals who are in need of a getaway to work on their projects here, at the same time be surrounded and synergized by creative inspirations from our lives' work. 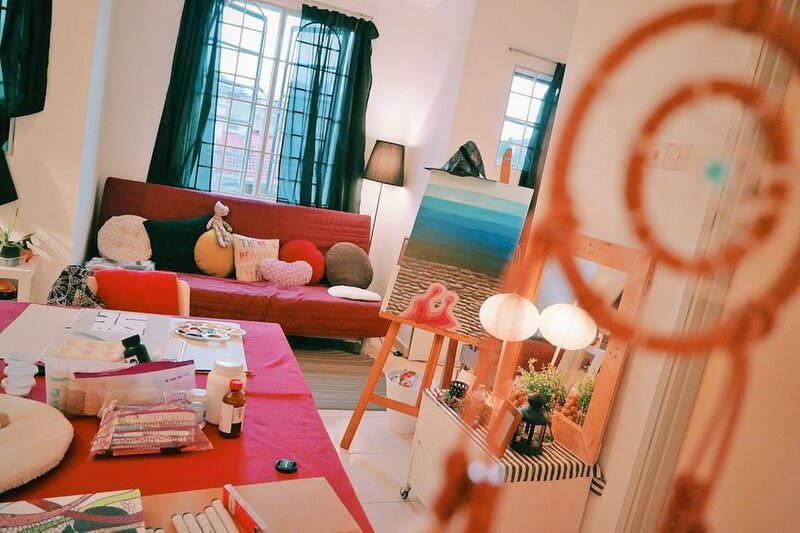 I also organize workshops and meetups here and they are open to our coliving housemates and the public, especially folks living around the area and Kuala Lumpur. Sometimes, I run art events to give back to the creative community around my city. In 2016, I co-organized an art show together with a local gallery featuring an eclectic mix of local artists, poets and musicians called Once Upon A Midnight. Or, just drop by to come chit chat and cowork together with me at The Hatchery Place. Drop me a note, look me up for collaborations, or arrange a studio visit, I'd love to hear from you!